Before dismantling your old unit, make sure the hot water feed is on the left, and that the cold water feed is on the right. Call a professional if that is not the case. Prepare parts and tools with close access to the connections. 4 - Install the mixer and tighten firmly. The nuts must not touch the escutcheons. Adjust if necessary and verify horizontal positioning. 5 - Remove the assembly. Note the depth between the s union connectors and the wall. 1 - Seal the thread of the s union connector using PTFE tape, wrapped in the tightening direction. 6 - Then remove the red and blue caps from the mixer. Make sure the filters are placed correctly, with the rounded side facing inwards. 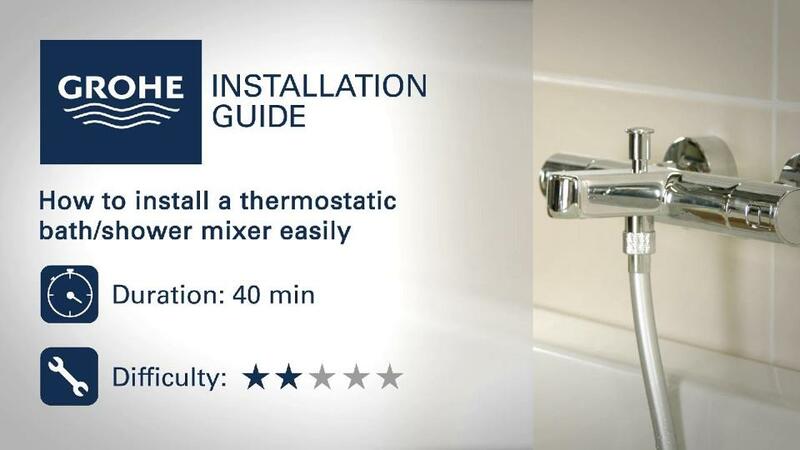 Now make sure the thermostatic mixer is operating properly. 1 - Using a thermometer check the water temperature. If it is 38°C when the handle guide lines up with the 38°C marker of the shower body, then no adjustment is needed. 2 - If adjustment is necessary, close the plug-hole and remove the cover on the mixer handle using a small flat-head screwdriver. 3 - Loosen the screw, then remove the handle. 4 - Run the water. Adjust the thermostatic cartridge by turning the notched black element until the temperature reaches 38°C. Put the handle back with the guide on the handle facing 38°C. Screw in the handle and put the cover back on.